Point of Origin is a collection of mixed media works carefully examining dynamic embodied relationships – those between trauma and fibromyalgia, between capitalism and ableism, between legacy and wisdom, between Blackness and life, between freedom and place, and between dreaming and staying woke. Drawing on a combination of traditional, contemporary, and afro-futuristic aesthetics and techniques, Point of Origin, through the use of poetry, quilts and tapestries seeks to respond holistically to the singular source ideology of allopathic/Western medicine and its effects and influence on complex bodies and beings. Point of Origin invites the visitor to consider – How would we think about our days if instead of squeezing our complicated bodies into others’ formulas for life, we were encouraged and supported to live our days in pulse to our own rhythm? 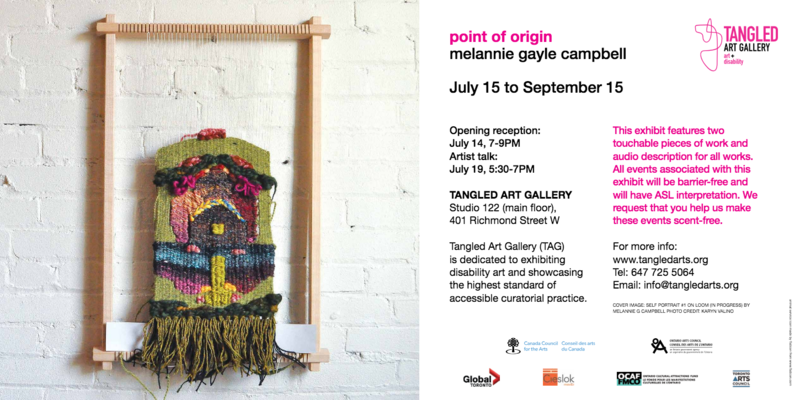 melannie g campbell is a multi-disciplinary artist and educator utilizing poetry, textiles, performance art and digital media to explore themes of grief, trauma, resilience, and intersectionality. melannie is a VONA alum, and recipient of project and creation grants from the Cue Writers Bursary, ArtReach Toronto (Toronto Arts Council), and the Canada Council for the Arts. as a queer, chronically ill, disabled, and black artist, melannie is ardent about interdependence, pursuit of justice and in presencing the union of art and activism as agents of change in our present and future realities. melannie’s work is grounded in their experience with and dedication to art and community building that centers the bodies, minds and stories of those conventionally designated as having no value Among their goals are: learn to swim, write a book(s), and dismantle all systems of oppression. mel is, as always, a work in progress. For a screen-reader version of our flyer, click here.